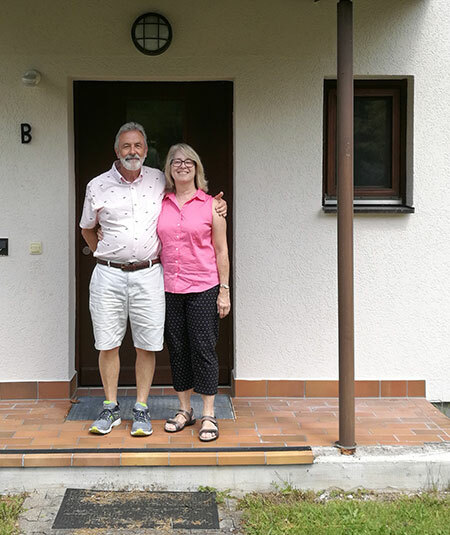 GARMISCH, Germany — Kathy Leslie, who lived three years of her childhood in the Garmisch Breitenau Housing Area, took a trip down memory lane when she visited Artillery Kaserne with her husband, Ian, during a recent trip to Europe. It was her first time back to Garmisch after 55 years. The couple, who now live in Thousand Oaks, California, was welcomed at the gate and escorted onto the installation. “It was so nice to be able to come back and visit our old home” Leslie said. In 1958, then Capt. Bill Wilson was assigned to the Garmisch military community. He arrived with his wife Ethel and their three children, Martha, Bill and Kathy (another child, Rosemary, was born in Munich while the Wilson family was stationed in Bavaria). The family lived in Garmisch-Partenkirchen for three years, departing in early 1962 when they moved on to Fort Bragg, North Carolina. In 1965, Wilson retired from Special Forces at the rank of major. While assigned to Garmisch, the family lived in a duplex house in the Breitenau Housing Area adjacent to Artillery Kaserne. Coincidentally, the very same unit, 708 B, was temporarily vacant and the family was able to visit their old home accompanied by Gaby Furitsch, housing manager, Garmisch, who filled them in on the history and the development of the housing area. Her sister, Martha, visited Garmisch in the 1990’s and refreshed Leslie’s memory, but there has been more renovations done since, including the addition of another room. Leslie took pictures for her family, and her husband remembered a few things he’d seen in an old family video. “I remember well how we’d set up our furniture and who slept in which bedroom,” Leslie recalled. After a windshield tour of the installation, Leslie said “Auf Wiedersehen” once more to Garmisch.